Winner of the People’s Choice award for Best Role-Playing Expansion at UK Games Expo 2018, Leagues of Cthulhu is a supplement for use with Leagues of Adventure: A Rip-Roaring Setting of Exploration and Derring Do in the Late Victorian Age! and its expansion, Leagues of Gothic Horror. Published by Triple Ace Games following a successful Kickstarter campaign, Leagues of Cthulhu is written for use with the Ubiquity System, and draws on the writings—but not the attitudes—of author H.P. Lovecraft to present new skills, talents, and flaws; leagues and archetypes; sanity mechanics, magic, and manuscripts; and a gazetteer of Mythos threats and locations, plus Game Master advice. 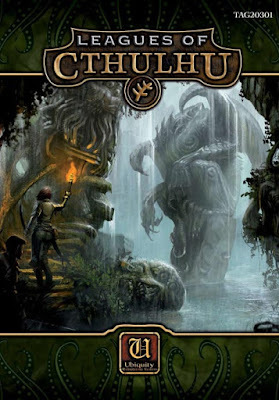 All together, Leagues of Cthulhu not only brings the Cthulhu Mythos to the 1890s of Leagues of Adventure and Leagues of Gothic Horror, because it employs the Ubiquity System—first used in ExileStudio’s Hollow Earth Expedition—it also brings the Cthulhu Mythos to other roleplaying games which uses those mechanics. So, want to bring Cosmic horror to the Hollow Earth of Hollow Earth Expedition, the Mars of Space: 1889, the seventeenth century France of All for One: Régime Diabolique, or the post-apocalypse of Desolation, then Leagues of Cthulhu is the obvious supplement to refer to. The starting point for any Roleplaying Game of Lovecraftian investigative horror is of course, the works of H.P. Lovecraft—and that is where Leagues of Cthulhu begins—and ends. The focus is thus on a limited number of entities—gods and creatures—as well as tomes and spells, with an emphasis on forbidden knowledge, the advancement of science without moral guidance, and dangerous secrets. This means that both focus and supplement possesses a certain purist approach. That said, the use of the Ubiquity System means that the mechanics pull Leagues of Cthulhu towards a Pulp feel and sensibility. It also keeps contents of the supplement quite trim. In general, the mechanic scales the range of a player character sanity to between one and ten, in line with the skill range, but still manages to keep it relatively nuanced, especially with the specialisations for the Elder Lore skill. This goes hand-in-hand with an increase in the Horror rating from between one and five to between one and ten. This reflects the greater scope and overwhelming impact of the Mythos and its entities. In terms of Talents, those new to Leagues of Cthulhu are mostly Flaws as much as they are Talents, so are perfectly Lovecraftian. They are Bloodlines, such as Jermyn and Pickman, and they all have their advantages, but they have their downsides too. The exact nature of their negative side is kept hidden in the Game Master’s section. This being a Leagues of Adventure supplement, there are also new leagues, essentially clubs or societies focussed on particular interests. The Aeon Club is for those who have had encounters with the Mythos and is primarily a support club for survivors, although it does conduct and collect some knowledge, whereas the Hounds of Nodens will take some proactive against the Mythos. Several new pieces of weird science are given, each intended to aid in facing or recovering from facing the Mythos. Three sample characters are described in detail—Book Dealer, Fearful Academic, and Questing Mariner—and done in rather nice detail. It is a pity that there are just the three of them. Where in Leagues of Adventure, the Magical Aptitude Talent is required to cast magic, in Leagues of Cthulhu magic is wholly democratic. Anyone can learn it, that is if they are foolish or desperate enough to want to, have access to a mentor, or can study from a tome. Certain rituals, such as Augury, Healing, and Rewind Time, from Leagues of Gothic Horror do not fit the Cosmic Horror of Leagues of Cthulhu, and so are not used. Instead, most of the given rituals consist of Call, Commune, and Summon type spells, and these are joined by the expected rituals such as Elder Sign and Voorish Sign. Leagues of Cthulhu greatly parrs the spell list down in comparison to other Roleplaying Games of Lovecraftian investigative horror. This does mean that the Call, Commune, and Summon spells are genericised somewhat, but the Game Master should add elements and aspects to made the demands of such casting, if not more demanding, then more flavourful. In comparison, the treatment of Eldritch Tomes is more detailed and flavoursome. All of the classics are included—the Necronomicon (of course), Cultes des Ghouls, Von Unaussprechlichen Kulten, The King in Yellow, Nameless Cults, and so on—as well as some interesting new ones, such as My Journey to the Inner World by Jeff Combos-Tower and the Winkelgleichungen Zum Queren Der Dimensionen by Patric Götz. These are all drawn from Lovecraft’s own fiction, and this continues with the gazetteer and bestiary. The former takes the reader from Africa and the Americas to the Ocean Floor and Other Worlds, and at twenty-five pages in length, is the longest section in the volume. In each case, it provides a continental—or larger—sized overview, before focusing on specific places. So, in Africa, the Ugandan Ruins from the short story ‘Winged Death’ and Queen Nitocris’ Tomb from ‘The Outsider’ and ‘Imprisoned with the Pharaohs’; Arkham and The Witch House from ‘Dreams in the Witch House’ in the Americas; the eponymous cities from ‘The Nameless City’ and ‘The Doom that Came to Sarnath’; the Black Museum from ‘The Hound’ and Kilderry Bog from ‘The Moon-Bog’; and so on. It does deviate a little by including The Black Monolith from Robert E. Howard’s ‘The Black Stone’, but every location is accorded a solid description as well as an adventure hook. For its treatment of the Great Old Ones, Leagues of Cthulhu takes a leaf out of Trail of Cthulhu, Pelgrane Press’ roleplaying game of Lovecraftian investigative horror, by giving them but a single stat. Here it is their Horror Rating, the point being that such entities cannot be killed in the material sense. They can be contacted, communed with, and summoned, necessitating the learning of the spells earlier in the supplement. The horrors themselves, the lesser entities, creatures, alien races, and servitors, from the Black Spawn of Tsathoggua, Black Winged One, and Colour Out of Space to Shoggoth, Spawn of Cthulhu, and Spawn of Shub-Niggurath, are given stats, since they can be affected on the material realm. Less dangerous foes, mainly because they lack a Horror Rating, come in the form of cults and their leading proponents, for example, Pierre Deveraux for the Church of Starry Wisdom. Rounding this out are write-ups of various notables of the Mythos, some anathema to the Mythos, such Doctors George Gammell Angell and Henry Armitage, others anathema to mankind, such as Keziah Mason and Lavinia Whateley. Lastly, as well as listing the skeletons in the closet for each of the Bloodline Talents given earlier in the supplement, Leagues of Cthulhu closes with some advice on running a game of Lovecraftian investigative horror for the Leagues of Adventure and Leagues of Gothic Horror Game Master. It sets the default Style of Play as Dark, emphasises how Leagues of Cthulhu is very much an investigative game rather than one of action or exploration, and provides guidance as to how clues should be used to help rather than hinder the player characters. It also points out that being set in the Mauve Decade of the 1890s, the Leagues of Cthulhu setting is set before and therefore not bound by the canon of Lovecraft’s writings, so the Game Master has more of a free rein when creating investigations and mysteries of her own. The advice is borne of years of experience with other roleplaying games of Lovecraftian investigative horror and so both useful and to the point. Physically, Leagues of Cthulhu is slim hardback done in full colour with some rather nice pieces of artwork. The writing is to the point and in keeping with the supplement’s trimmed down treatment of the Mythos. One issue with Leagues of Cthulhu is that it is a supplement of a supplement, so to get the fullest out of it, the Game Master will need Leagues of Gothic Horror as well as Leagues of Adventure. To counter that, Leagues of Cthulhu does not repeat anything from either the roleplaying game or the supplement. This leaves Leagues of Cthulhu to focus on the Mythos without any extraneous content which would have increased its page count unnecessarily—though the Easter Eggs might count. Ultimately, what Leagues of Cthulhu does is shift Leagues of Adventure: A Rip-Roaring Setting of Exploration and Derring Do in the Late Victorian Age! and Leagues of Gothic Horror further away from scenarios focusing on exploration and adventure to those focusing on investigation, specifically investigation into the manifestations of Cosmic Horror which threaten the globetrotters’ sanity, let alone the future of mankind and the planet! It does this with a neatly trimmed down treatment of the Cthulhu Mythos that draws primarily on Lovecraft’s own writings to provide a Purist approach for use with what would otherwise be the Pulp mechanics of the Ubiquity System. Leagues of Cthulhu opens up the Cthulhu Mythos to Leagues of Adventure and the Ubiquity System in both an efficient and effective manner, ready to drive us insane whatever the setting. Now in its eleventh year, Saturday, June 16th is Free RPG Day and with it comes an array of new and interesting little releases. Invariably they are tasters for forthcoming games to be released at GenCon the following August, but others are support for existing RPGs or pieces of gaming ephemera or a quick-start. Like the support for Free RPG Day in 2017, Goodman Games has released the Dungeon Crawl Classics Roleplaying Game Quick Start Rules & Intro Adventure, which provides an introduction to the publisher’s Dungeon Crawl Classics Roleplaying Game. It takes its cue from the Dungeon Crawl Classics Roleplaying Game Adventure Starter published in 2011, but has been expanded enough for the rules to cover characters from Zero Level to Second Level, provide two adventures, and introduce the key concepts of the roleplaying game. In the process, it has grown from sixteen to forty-eight pages. As with the previous version from 2017, the Dungeon Crawl Classics Roleplaying Game Quick Start Rules & Intro Adventure can be divided into three parts. The longest are rules, followed by a short introductory adventure and then by flipping the booklet over, a longer adventure. Derived from the d20 System, the Dungeon Crawl Classics Roleplaying Game sits somewhere between Basic Dungeons & Dragons and Advanced Dungeons & Dragons in terms of its complexity. The most radical step in the Dungeon Crawl Classics Roleplaying Game is the starting point. Players begin by playing not one, but several Zero Level characters, each a serf or peasant looking beyond a life tied to the fields and the seasons or the forge and the hammer to prove themselves and perhaps progress enough to become a skilled adventurer and eventually make a name for themselves. In other words, to advance from Zero Level to First Level. Unfortunately, delving into tombs and the lairs of both men and beasts is a risky venture and death is all but a certainty for the lone delver… In numbers, there is the chance that one or more will survive long enough to go onto greater things! This is what the Dungeon Crawl Classics Role Playing Game terms a ‘Character Creation Funnel’. Dungeon Crawl Classics Roleplaying Game Quick Start Rules & Intro Adventure provides rules for the creation process, a player rolling for six Abilities—Strength, Agility, Stamina, Personality, Intelligence, and Luck—in strict order on three six-sided dice, plus Hit Points on a four-sided die and an occupation. The latter will determine the character’s Race—Race is a Class in the Dungeon Crawl Classics Roleplaying Game just as it was in Basic Dungeons & Dragons, a weapon, and a possession related to his occupation. Of the stats, only Luck requires any explanation. It can be used for various skill checks and rolls, but its primary use is for each character’s single Luck Benefit—in Ernest’s case, when rolling for critical rolls. It is burned when used in this fashion and can only be regained by a player roleplaying his character to his Alignment. The Luck bonus also applies to critical hit, fumble, and corruption rolls as well as various Class-based rolls. For example, the Elf receives it as a bonus to rolls for one single spell and a Warrior to rolls for a single weapon such as a longsword or a war hammer. Further, both the Thief and the Halfling Classes are exceptionally lucky. Not only are their Luck bonuses doubled when they burn Luck, they actually regain Luck each day equal to their Level. In addition, if a party has a Halfling amongst its numbers that Halfling can pass his expended Luck to other members of the party! Mechanically, for a character to do anything, whether Sneak Silently, cast a spell, or make an attack, a player rolls a twenty-sided die and after adding any bonuses hopes to beat a Difficulty Class or an Armor Class. Rolls of one are a fumble and rolls of a twenty are a critical. The Dungeon Crawl Classics Roleplaying Game Quick Start Rules & Intro Adventure includes a Fumble Table as well Critical Hit Tables for each of the Classes. Famously, the Dungeon Crawl Classics Roleplaying Game also uses a multitude of dice, including three, five, seven, fourteen, sixteen, twenty-four, and thirty-sided dice as well as the standard polyhedral dice. Although penalties and bonuses can be applied to dice rolls, the dice themselves can get better or worse, stepping up or stepping down a size depending upon the situation. For example, a Warrior can attack twice in a Round instead of attacking and moving, but makes the first attack using a twenty-sided die and the second attack using a sixteen-sided die. Fortunately, neither of the scenarios in the Dungeon Crawl Classics Roleplaying Game Quick Start Rules & Intro Adventure make much use of this full polyhedral panoply, but if necessary, dice rolling apps can be found which will handle such dice rolls. Magic works differently to the Vancian arrangement typically seen in Dungeons & Dragons. Magic is mercurial. What this means is that from one casting of a spell to the next, a spell can have different results. For example, the classic standby of First Level Wizards everywhere, Magic Missile, might manifest as a meteor, a screaming, clawing eagle, a ray of frost, a force axe, or so on. When cast, a Wizard might throw a single Magic Missile that only does a single point of damage; one that might do normal damage; unleash multiple missiles or a single powerful one; and so on. Alternatively, the Wizard’s casting might result in a Misfire, which for Magic Missile might cause the caster’s allies or himself to be hit by multiple Magic Missiles, or to blow a hole under the caster’s feet! Worse, the casting of the spell might have a Corrupting influence upon the caster, which for Magic Missile might cause the skin of the caster’s hands and forearms to change colour to acid green or become translucent or to become invisible every time he casts Magic Missile! This is in addition to the chances of the Wizard suffering from Major or even Greater Corruption… Some ten spells are detailed Dungeon Crawl Classics Roleplaying Game Quick Start Rules & Intro Adventure, taking up roughly, a quarter of the booklet. One notable difference between the 2018 version of the Dungeon Crawl Classics Roleplaying Game Quick Start Rules & Intro Adventure and previous versions is the inclusion of different spells. So no Magic Missile, but Choking Cloud and Colour Spray for the Wizard, for example. Certainly, the lack of any healing spells will change the players’ approach to either adventure in the Dungeon Crawl Classics Roleplaying Game Quick Start Rules & Intro Adventure, but perhaps Resist Cold or Heat will prove to be useful in the second, new adventure. Once past the funnel, the characters can move up to First Level and acquire a proper Class—either Cleric, Thief, Warrior, or Wizard, or one of the Races, Dwarf, Elf, or Halfling. Further information is provided so that a character can progress to Second Level. The adventures in Dungeon Crawl Classics Roleplaying Game Quick Start Rules & Intro Adventure should be enough for a character to reach First Level. Getting to Second Level and the second adventure is another issue, at least with this version of the Dungeon Crawl Classics Roleplaying Game Quick Start Rules & Intro Adventure. Dungeon Crawl Classics Roleplaying Game Quick Start Rules & Intro Adventure includes two adventures. 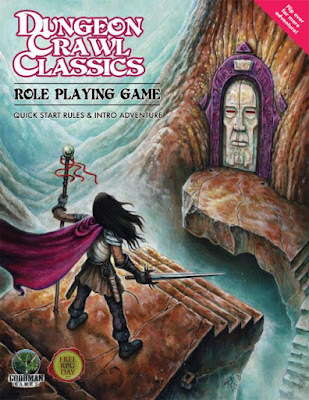 The first, which immediately follows the rules is ‘The Portal Under The Stairs’, which appeared in the original Dungeon Crawl Classics Roleplaying Game Adventure Starter back in 2011. This has the would-be adventurers venturing into an ancient war-wizard’s tomb after its entryway becomes open when the stars come right. Designed for Zero Level and First Level characters this is a short, just ten location dungeon primarily consisting of traps and puzzles with some deadly combat encounters thrown in. Its three pages are short enough that a group could roll up their characters and funnel them through the adventure to see who survives in a single session. The second scenario, located on the opposite side of Dungeon Crawl Classics Roleplaying Game Quick Start Rules & Intro Adventure is ‘Man-Bait for the Soul Stealer’. Now in the Dungeon Crawl Classics Roleplaying Game Quick Start Rules & Intro Adventure from 2017, the scenario included was ‘Gnole House’. Inspired by the writings of Lord Dunsany, this presented a bucolic, genteel demesne, a lonely house full of detail and hidden horrors. Designed for characters of First Level, it provided a good mix of exploration and examination with some combat and a little roleplaying which could easily be run after the players have funnelled their characters through ‘The Portal Under The Stairs’ with some of them hopefully have survived to First Level. The scenario in the 2018 version of Dungeon Crawl Classics Roleplaying Game Quick Start Rules & Intro Adventure is a little different. ‘Man-Bait for the Soul Stealer’ is a classic dungeon rather than the ‘house of horror’ that is ‘Gnole House’. It is also designed for between four and eight player characters of Second Level who have drawn to a lake in which stands Blood Smoke Island. Enshrouded in crimson smoke, the island is said to be home to a dragon, a demon, or even a mad wizard, but above all, the rumours tell of treasure and glory. On the shore stands a statue of a shield maiden and it is she who gives the adventurers their real motive for rowing across to Blood Smoke Island: She wishes to escape from the servitude of her master Odag, a centuries old wizard who is mining a strange meteor on the island. If the adventurers can find and smash his means of prolonging his life, then freedom will hers and a boon will be theirs! This is not the only possible hook into ‘Man-Bait for the Soul Stealer’, but the Game Master will need to foreshadow any one of these hooks in a prior adventure. What follows is a short, eight-location descent into a steaming hell, with lots of fire and lava related themes and encounters. Each of the locations is nicely detailed beyond just the monsters and overall, it should take no more than a session or two to complete. It is relatively easy to add to an ongoing campaign for which it is really just a side trek. As decent an adventure as ‘Man-Bait for the Soul Stealer’ is, as an adventure for Second Level characters, it does not work as a sequel to ‘The Portal Under The Stairs’. The latter will get the player characters, those that survive that is, from Zero Level to First Level, but not Second Level. There is nothing in the Dungeon Crawl Classics Roleplaying Game Quick Start Rules & Intro Adventure to bridge that gap and no advice as to where to look for that missing link. In fact, ‘Gnole House’, from the Dungeon Crawl Classics Roleplaying Game Quick Start Rules & Intro Adventure in 2017 would actually work as that link… That said, Goodman Games publishes numerous adventures for the Dungeon Crawl Classics Roleplaying Game, many of which could be used as that bridge. Physically, the 2018 version of Dungeon Crawl Classics Roleplaying Game Quick Start Rules & Intro Adventure is well presented, the writing is clear, and artwork is in general excellent throughout, echoing the style and ethos of the three core rulebooks for Advanced Dungeons & Dragons. Ultimately, the issue with it is the step between ‘The Portal Under The Stairs’ adventure and ‘Man-Bait for the Soul Stealer’. Although it is not quite perfect, the Dungeon Crawl Classics Roleplaying Game Quick Start Rules & Intro Adventure is a good package. The rules are nicely explained, the style of game is nicely explained, the artwork is good, the two adventures are good, if disconnected. Any player or Game Master with any experience of Dungeons & Dragons will pick this up with ease and be able to bring it to the table with relatively little experience—and once the first adventure is complete, only a bit more preparation is required to play the second adventure. Perhaps not quite as good as versions released in previous years, The Dungeon Crawl Classics Roleplaying Game Quick Start Rules & Intro Adventure is simply a good introduction to the game and a little bit more. Now in its eleventh year, Saturday, June 16th was Free RPG Day and with it came an array of new and interesting little releases. Invariably they are tasters for forthcoming games to be released at GenCon the following August, but others are support for existing RPGs or pieces of gaming ephemera or a quick-start. In 2017, Paizo Publishing released such a preview, Starfinder: First Contact, of its then forthcoming Science Fantasy Roleplaying Game, Starfinder. This year Paizo Publishing has released the first scenario for Starfinder for Free RPG Day, Skitter Shot. At just sixteen pages, this is a short adventure, playable in a good session, specifically designed for use with Starfinder Alien Archive, the supplement which details some eighty life-forms, twenty Player Character races, alien technology aplenty, and more. 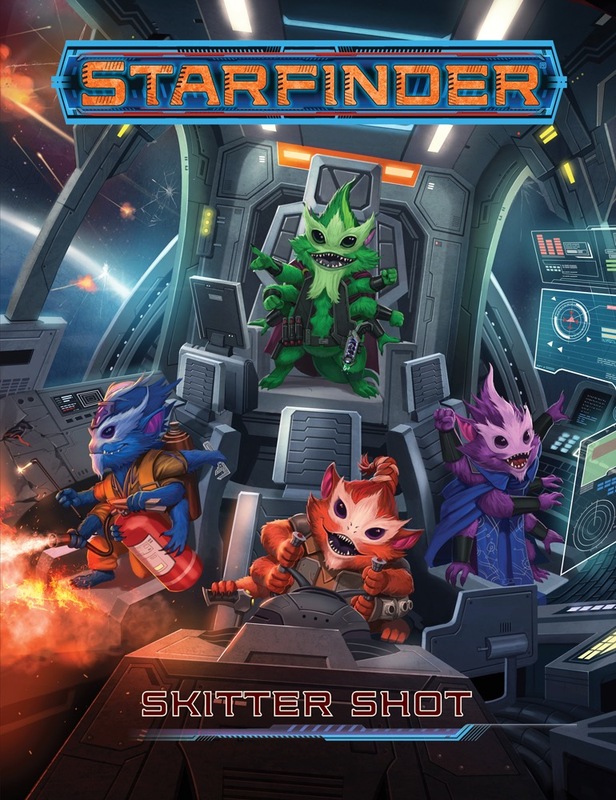 Designed to be played by four players, Starfinder Skitter Shot casts them as the cheerfully manic, gleefully helpful, vibrantly coloured, six-armed and furry creatures known as Skittermanders. Four pre-generated Skittermanders are provided in the adventure—Dakoyo, Gazigaz, Nako, and Quonx—who serve as the crew of the Clutch, a salvage ship captained by their Vest boss, Nakonechkin Ginnady. 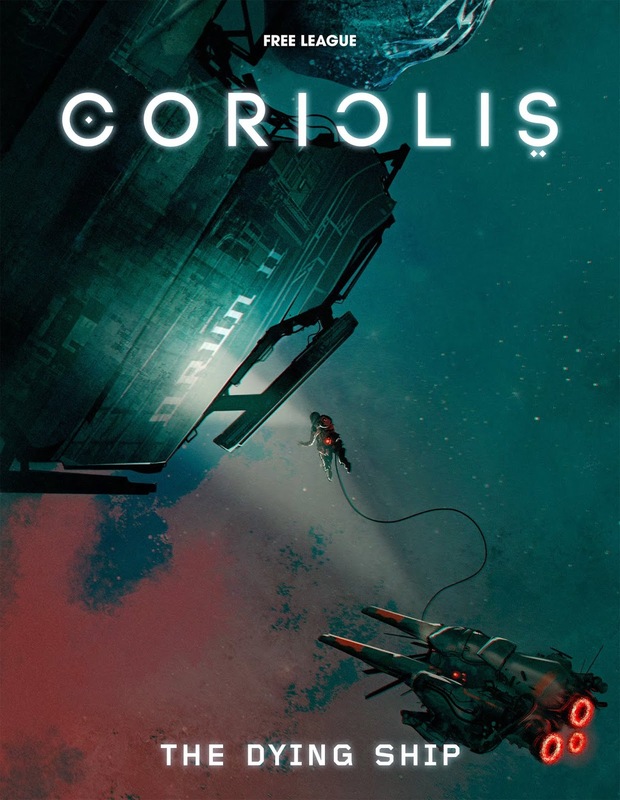 Out in the Vast beyond the Pact Worlds, the crew of the Clutch, searching for ancient battleships and space stations to salvage, come across a derelict ship, large, ornate, and with brass accents, looks to be very much out of place... As the adventure begins, Captain Nakonechkin Ginnady has been aboard the derelict ship for two hours and nothing has been heard from him. Something must have gone wrong, which means that Captain Nakonechkin Ginnady must be in trouble… Which can only mean, Skittermanders to the rescue! Once aboard the derelict vessel, the remaining crew of the Clutch discover that she is a luxury liner called the Emerald Empyrean. Unfortunately, she has fallen under the control of a rogue artificial intelligence who has taken the well-being of both crew and passengers to an extreme. The Skittermanders need to deal with a ship who at first views them as pets and then as a threat, passengers who have no faith in their boundless energy, and everything that the computer is in control of aboard the Emerald Empyrean. It being a short booklet, the adventure only runs to some eleven locations, plus three events, but all are fully detailed and easy for the Game Master to pick up and run with. The action sequences—traps and combat—outweigh the roleplaying situations, but that is not necessarily a bad thing. The adventure is challenging, but certainly rewarding if the players go at the adventure with the energy of the Skittermander pre-generated characters. There are four of these provided for use with Starfinder Skitter Shot. They include a Priest Mystic, a Xenoseeker Mystic, a Spacefarer Soldier, and a Scholar Mechanic, all Second Level. Each is detailed on a full page, complete with background, snatches of Skittermander slang, and a really nice illustration, as well as the stats. Players will need to refer to the Starfinder Alien Archive for full details of the Skittermanders, but really, they should be played as they appear—bumptious, gleeful, up for a challenge, and manic! Physically, Starfinder Skitter Shot is very nicely laid out and presented. The artwork is excellent, the writing clear, and the map easy to use. Starfinder Skitter Shot is a fun adventure. It is perhaps a bit of a cliche in terms of its plot, but for a straightforward one-shot—perhaps with room to develop into further adventures—that again, is no bad thing. It makes the adventure easy to run and grasp. Overall, Starfinder Skitter Shot nicely showcases the Starfinder setting of the Pact Worlds and provides a few hours of play with some bouncy, energetic, and lovable player characters. Now in its eleventh year, Saturday, June 16th is Free RPG Day and with it comes an array of new and interesting little releases. Invariably they are tasters for forthcoming games to be released at GenCon the following August, but others are support for existing RPGs or pieces of gaming ephemera or a quick-start. Like the support for Free RPG Day in 2016, The Derelict: A Tall of Terror for Call of Cthulhu, this year’s entry from Chaosium, Inc., is a scenario for use with Call of Cthulhu, Seventh Edition. The scenario is Scritch Scratch: A Modern-Day Call of Cthulhu Scenario for Two to Six Players. which asks the question, “What Terror Lurks Within the Gloomy Woodlands Surrounding a Sleepy English Village?”. Designed to be run using either Call of Cthulhu, Seventh Edition or the Call of Cthulhu 7th Edition Quick-Start Rules—free to download here—Scritch Scratch is a one-shot scenario set in a valley in the north of England, but which is relatively easy to set elsewhere as long it is just off the beaten track and very close to extensive woodland. It can be played in a single four-hour session, so is suitable as a convention or demonstration scenario. Six pre-generated investigators are included, but suggestions are given if a Keeper and her players wants to run the scenario with a different set of investigators. These six are divided into two distinct groups. The first consists of professional cleaners hired by the local council to clean a house in the out of the way village of Muscoby. The second consists of a film crew accompanying the cleaners to make documentary about them. The council is paying the cleaning crew a generous fee for undertaking the job and the film crew are there as a bonus. The scenario is designed as a mini-sandbox. The cleaning crew, accompanied by the film crew, arrive in Muscoby to do the job on the house. There they will find not only evidence of the owner’s strange occupation (he is currently in hospital), but also of the village’s equally strange history. What they learn at the house may warrant further investigations with both villagers and ex-villagers—the latter residing in a nearby town. Eventually, as they come to realise what the nature is of the weird secrets in Muscoby, those secrets will reveal themselves… The scenario allows for both confrontation with that secret or simply running away. Throughout the scenario there are snippets of advice based on the experience of the author and others playtesting it, including how to avoid misinterpretations of the term ‘cleaning crew’ and the council’s motives. This is in addition to various pieces of supplementary information. There are some fun NPCs for the Keeper to roleplay too and whilst these play upon the cliché of the country bumpkin, they do go beyond this just enough for them to be more fully rounded out creations. As to the Mythos in Scritch Scratch, it is present, but very much in the background. Instead, what the investigators and their players will be confronting is a manifestation of widespread folklore. What this means is that Scritch Scratch can be run as a horror scenario using the Call of Cthulhu rules rather than something obviously to do with the Cthulhu Mythos. The horror in the adventure is kept quite low key, the mix of weird occurrences and discoveries laying the groundwork for the Keeper to deliver some short, short shocks at the appropriate time. Scritch Scratch lacks two things. One is advice for running it with fewer than the six pre-generated investigators, though if that is the case, then the clean-up crew are probably more pertinent to the scenario than the film crew. The other is an introduction for the players and their investigators, so whilst the scenario explains the set-up for the Keeper, it does not do so for the players. This may well be an issue for the Keeper coming to Call of Cthulhu afresh or with relatively little experience as a Game Master. For an experienced Keeper, such an introduction is relatively easy to create, but it should have been included anyway to help the Keeper set both the scene and relationship up between the cleaning crew and the film crew as well as adding a degree of verisimilitude from the off. Barring the aforementioned lack of introduction, Scritch Scratch is well written and organised, and nicely illustrated. The latter are going to look good in colour whenever the scenario is collected in full anthology—as The Derelict was in Petersen’s Abominations: Five Epic Tales of Modern Horror—and do serve to illustrate certain locations and possible events in the scenario. In fact, the Keeper might like to use them as illustrative handouts at the appropriate time. Of course, being a release for Free RPG Day, devotees of Call of Cthulhu are going to want a copy of Scritch Scratch, however good it is. 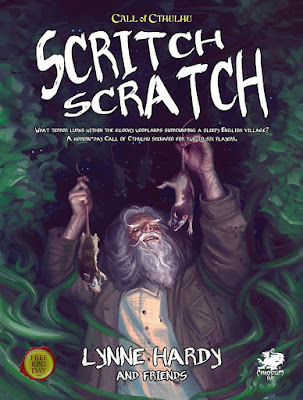 Fortunately, Scritch Scratch: A Modern-Day Call of Cthulhu Scenario for Two to Six Players is a pleasingly low key one-shot of bucolic mystery and horror. The anthology opens with ‘Midnight Sub Rosa’ by Ruth Tillman. This takes the investigators to backwoods Alabama and the small town of Rosa, to solve the mystery of a missing occult tome. The diary of Ezekiel de la Poer, a notorious necromancer hanged in 1736, has been stolen from the home of a retired professor of American Folklore. Both diary and its owner were to be the subject of a symposium to be held by the professor and various academics on what is the bicentennial of de la Poer’s death. The question is, who stole it, what was in the diary, and what effect might it have on the thief? The scenario gets off to a bit of a woolly start with its being rather unclear as to how the investigators are to be involved and what is going on. What is going on is that in the default set-up, the investigators work for the Armitage Inquiry, one of the campaign frameworks presented in Trail of Cthulhu, tracking down and dealing with occult and Mythos tomes which pose a threat to humanity. What this means is that the Mythos is placed upfront in this scenario and the investigators, if not actually aware of it, should almost be aware of it. As the investigators arrive, the town of Rosa is beset by strange events which sets up the second strand of the investigation. The first is more or less a locked room mystery in which the investigators determine who stole the book, where it is now, and what its contents are, whilst the second deals with its effects in the wild and on the local populace. Inspired by the H.P. Lovecraft stories, ‘Rats in the Walls’ and ‘Statement of Randolph Carter’, this is a decent enough scenario in which the woods really only play a minor part. The real issues with the scenario are twofold. It could have been better organised, especially at the start where it is unclear quite what is going on, especially as where the investigators are concerned. Then for a scenario originally intended to be used as a convention scenario, it really is too long in its current form and the provided pre-generated investigators really need some background. This is very much less of an issue in Adam Gauntlett’s ‘The Silence Mill’. The investigators receive a letter from a comrade thought to have died in the Great War seeking their help, but not before they have had to come to the aid of the postman trying to deliver it! The son of their long lost friend has not only been accused of murder, he has been accused of being a werewolf, and the investigators are asked to come to what is all but feudal Brittany in France to help him. When the investigators get there, events serve to leave them with little in the way of help, but as the scenario unfolds, the local legends of werewolves, the templars, and the Holy Grail all point towards the ancient and dense forest of Paimport where no-one but the local marquis and his men will walk. His hold over the locals means that the investigators will have to overcome both their reticence and the difficulties of the French legal system for non-Francophiles—the default set-up and the pre-generated investigators suggest that they are English—if they are to save the accused and thwart the plans of the cult which makes the forest its own. Where ‘The Silence Mill’ really shines is in the combined layers of legends which the author overlays the Mythos to give it the cultural depth that few scenarios achieve. Mostly obviously King Arthur and the Holy Grail, under which he works the Mythos. His choice of Mythos would suggest the West Country of the United Kingdom as a suitable location, but by shifting the location to Northwest France, the author can not only layer in both werewolf and templar myths, but also localise them in the Brocéliande. This gives ‘The Silence Mill’ a rich cultural depth which few scenarios for Lovecraftian investigative horror attain. With its hook being derived from events during the Great War, there is also room here for the Keeper to run a prequel to the events of ‘The Silence Mill’, perhaps using a scenario from the anthology, Dulce et Decorum Est: Great War Trail of Cthulhu. Although ‘Midnight Sub Rosa’ explores racism and segregation to an extent, it is intrinsic and central to the third scenario, ‘Dreaming of a Better Tomorrow for 30 Dollars a Month’. Written by Chris Spivey, the author of the highly regarded Harlem Unbound: A Sourcebook for the Call of Cthulhu and Gumshoe Roleplaying Games, its investigators are African Americans very much taken out of their comfort zone. In the desperate years of the Great Depression, they have managed to enrol in the Civilian Conservation Corps, a paramilitary public work relief programme established as part of the New Deal. Although theirs is one of the few integrated teams in Civilian Conservation Corps, the investigators have to contend with near constant racism of varying vehemence as well as the strict daily regime of life in the corps. Both will greatly hamper their researches and investigative efforts when they are recruited by the local Chief of the Safety Division to look into a number of strange deaths and disappearances amongst the African American corps members in the area. This is reflected in the mechanics which make spends and so on more expensive for African American investigators rather than reducing the number of Ability points they have available to spend and so reducing their capability. This being Vermont, the obvious Mythos threat here would be the Mi-Go, but this is not so in ‘Dreaming of a Better Tomorrow for 30 Dollars a Month’. In fact, the singular threat in the scenario is probably the least interesting element of it, whereas the backdrop and the social constraints are not only more interesting, they are also more of an interesting challenge to understand, explore, and roleplay. If the need to sacrifice dignity and swallow your pride is explored in ‘Dreaming of a Better Tomorrow for 30 Dollars a Month’, Lauren Roy’s ‘The Coldest Walk’ explores the sacrifices that need to be made to mollify the Mythos. Deep in the woods of Wisconsin, near where bodies have been found crushed and frozen—even at the height of summer, the inhabitants of the town of Four Pines have come to an agreement. When the sky flashes in the bright colours of the aurora, one of their number must make a terrible choice lest they all succumb to the cold. Whether brought to Four Pines as journalists in search of story, private investigators looking for a missing person, alienists wanting to to research psychological trauma, or simply out of curiosity, what they will be presented with is a situation without any obvious antagonist. Getting the townsfolk to reveal the truth and the need for their activities, will take some good roleplaying, as will navigating their way to anything approaching a successful conclusion. The scenario presents multiple courses of action and thus multiple possible outcomes and overall, is probably the easiest of the five given in the anthology to adapt to other periods. ‘The Trembling Giant’ presents the woods not as home to some threat, but the threat itself, a global and more long term interpretation of one of the Mythos’ signature and most fecund of entities. This is balanced by the presence of the effects of that fecundity on the land neighbouring the tribe’s new territory, which serves to give the horror a more human and tentacular face. As with ‘The Silence Mill’ and ‘Dreaming of a Better Tomorrow for 30 Dollars a Month’, this feels well researched and like ‘Dreaming of a Better Tomorrow for 30 Dollars a Month’ provides a different and difficult approach to investigating the Mythos. Physically, Out of the Woods is well presented and in general well written, although it does feel a little rushed in places. Where required, the cartography is nice and clear, and the illustrations decent throughout. Each scenario includes a breakdown of its scenes and a diagram of how they should flow. Each scenario is also accompanied by various handouts and a set of pre-generated investigators. The very worst thing that could be said about this anthology is that many of the scenarios are of their time and place and thus are difficult to adapt to other to times and settings. That said, they are in many cases, one-shot scenarios, rather than something that could be added to existing campaigns. Certainly, ‘Dreaming of a Better Tomorrow for 30 Dollars a Month’ and ‘The Trembling Giant’ are the most difficult to adapt to other times and places, primarily because they include social horror as well as Lovecraftian investigative horror. The very least worst thing which could be said about anthology, is that its theme—nyctohylophobia—is inconsequential to the first scenario, ‘Midnight Sub Rosa’. Certainly, that theme plays a much stronger role in the following four scenarios and they are all the better for it. Of the five in the anthology, ‘The Silence Mill’ stands out because of its adaptation and layering of myth which give it a richness to its background, and ‘Dreaming of a Better Tomorrow for 30 Dollars a Month’ because it explores the social horror of the time as much as it does Cosmic horror. Nevertheless, there is not one bad scenario in the collection. 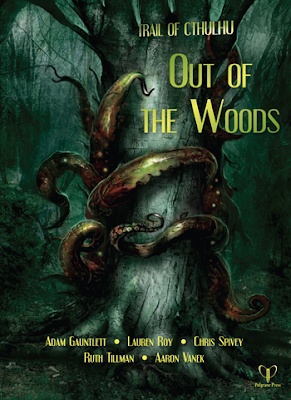 Out of the Woods successfully invokes our nyctohylophobia, our fear of the forest, with a quintet of excellent scenarios. Although written as part of the Hill Cantons setting, Misty Isles of the Eld is sufficiently isolated and self-contained enough that it can be placed almost anywhere in the Labyrinth Lord’s campaign setting. Designed for roughly four or five player characters of Third and Fourth Level, Misty Isles of the Eld is, like Slumbering Ursine Dunes before it, another ‘pointcrawl’ adventure rather than a hexcrawl. This depicts a region as a series of connected nodes rather than hex grid of locations and wilderness spaced in between. This makes travel in a sense more direct and avoids the problem of having an adventuring party wandering endlessly in the wilderness trying to find specific locations. Now where in Slumbering Ursine Dunes this turned the map of its region into something representational rather than exact and topographical, much like the map of the London Underground, on the island of the Misty Isles of the Eld, it is exact and topographical. This is because the layout of isle and the barriers which separate locations are pure artifice—giant meat-fed grubs arranged as ridges to suit the whims of the island’s current occupiers—and so arranged to be exact. 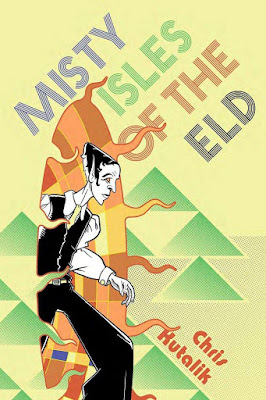 The clue to the nature of the Misty Isles lies in the phrase, “…arranged to be exact”, for it primarily consists of a once bucolic island occupied by the fey which has been suppressed and arranged into a fog-enshrouded, sterile, salt-white pocket hell by the intrusion of another dimension. This is Cold Hell, and from it sashay the Eld, tall and thin humanoids with elongated skulls and delicate fingers ready to impose their hierarchies on the island—and then perhaps beyond. As well as arranging the island’s topography with the purple and green-ribbed grub-ridges, the Eld have built a private party complex, a great monument which floats in the sky, a plantation house, an empty Pagoda City, and a vat complex where bodies are broken down and turned into fuel—body and soul. These last four sites make up the equivalent of dungeons Misty Isles of the Eld. As soon as the player characters step onto the island, they will be exposed to the weirdness of the Eld. Not just the gigantic ridge-grubs with mouth-openings into which human slaves shovel half rotted flesh, but also flesh-blobs cleaning up some unsightly accident or carrying out an execution, Eld patrols leading vatmen bread as trackers, white apes unleashed to gain some exercise, a faerie forest left as a Schadenfreude Arena, and much, much more. As soon as the player characters begin interacting with the Eld, they live up to their Lawful (Evil) alignment and they react. The Eld Defence Plan is literally written into Misty Isles of the Eld with the island’s Eld Command Structure, led by Sub-Colonel Zogg, raising the Alert Level to deal with the intruders after they are first encountered by a patrol, have visited one of the island’s major locations or murdered an important Eld, and disrupted activities at one or more the facilities on the island. Eld Command will first increase the number of patrols before actively hunting the intruders. This is not the only sign of their progress, as the Chaos Index introduced in Slumbering Ursine Dunes and Fever-Dreaming Marlinko is in Misty Isles of the Eld inverted into the Anti-Chaos Index which tracks the consequences of the player characters’ actions, ideally to reverse the Eld influence on the isles and so return them to their former state. There is a strangeness to every one of the eighteen locations on the Misty Isles, but the four ‘dungeons’ are unlikely to be anything like the player characters have ever encountered before. Rather than dungeons, they are complexes—work complexes, military complexes, factory complexes, and pleasure complexes—built using Eld superscience and magic. None of these complexes are particularly large, but all four are rife with weird detail and flavour. In addition to describing the various locations and encounters to be found on the island, Misty Isles of the Eld comes with four appendices. These include a bestiary of the weird and wondrous creatures and creations the Eld brought with them from Bonegrinders and Cerebral Boreworms to Vat-Giants to Vatmen; a new Class, the Psychonaut; complete descriptions of the Eld artefacts to be found in the Misty Isles—weapons, tools, and miscellaneous; and reprints of the book’s various maps. The new Class is the Psychonaut, which treats Psionics as a combination of mutations and permanent spell-like powers, each with a limited number of uses per day. These include Aptitude Accelerant, which enables a Psychonaut to raise an attribute temporarily to 18 once per day, Biting Quip which enables him to deliver a comment barbed enough to drive the victim into a catatonic state, and Retrovlution, which drives its victims back down the evolutionary ladder. This all comes at the cost of several deformations, such as rooster clawed feet or a secondary brain. The Psychonaut is primarily a Class for the Eld, but perhaps a player character might develop these powers if exposed to the wrong—or the right—mutagens. The Eld Artefacts give the player characters something to pick up and play with. All a player has to do is make a roll against his character’s Intelligence, the number of six-sided dice to be rolled depending on the complexity of the item. Once understood, their use can be taught to other characters of sufficient intelligence. There is the danger though that the devices will break in the learning attempt… This is a pleasingly simple way of handling fantasy characters meeting technology a la Metamorphosis Alpha or Gamma World. Physically, Misty Isles of the Eld is well presented with stylish artwork and cartography which capture the studied oddness of the Eld. There is however, a lot going on in the scenario and the Labyrinth Lord will need to give it a careful read-through to understand how the different parts mesh together. Certainly, a better overview could have been provided rather than having to put these different parts together as you read through the book. There have numerous scenarios for Dungeons & Dragons-style games in which the player characters encounter advanced technology, most obviously in S3 Expedition to the Barrier Peaks for use with Advanced Dungeons & Dragons, First Edition, but in Misty Isles of the Eld, the player characters get to encounter both that technology and its wielders—and they are no fools. This means that the player characters will be faced with the challenge of strange magic and intelligent foes in addition to the dangers of exploration. This is in addition to the arch-weirdness and horror which permeates the scenario and really only makes it suitable for adult players. Misty Isles of the Eld is one-part penetration by Moorcockian Science Fantasy from beyond, one-part extradimensional Melnibonéan-like space elves wanting to impose order, and one-part dazzle white home furnishings of the early seventies combined with Soviet-era brutalist monument design. This is a genuinely unique combination and the fact that the author manages to pull it off, marks the Misty Isles of the Eld as a singularly impressive scenario.